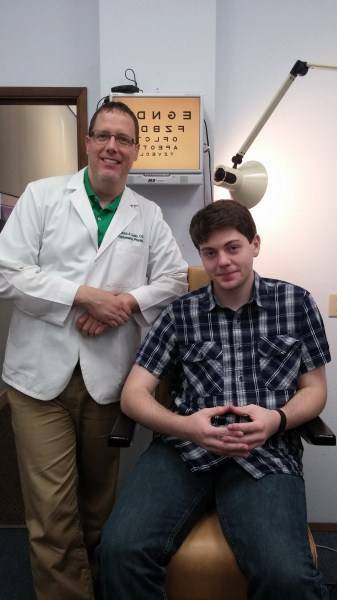 My son, Ben, started to need corrective vision about 2-3 years ago for nearsightedness. Our family history is one where my husband and I also have myopia that rapidly progressed in our teen years from bad to really awful. We were hoping to prevent this same thing from occurring for our son, and Dr. Cusic of Optical Images recommended a new technique to arrest the myopia using corrective contacts that are worn only at night to reshape the eye and provide 20-20 eyesight in the daytime. Ben has been doing this now for the past two years and not only has his eyesight not gotten worse, he feels he sees the world in HD when he wears the contacts! We are extremely happy with our son's outcome and Ben is looking forward to many more years of seeing the world through 'new eyes'. Many thanks!